The Fed met market expectations and raised the Federal Reserve Rate to 1.5% now equal with the RBA rate. As the year closed, President Trump passed his tax bill which is expected to promote growth. The US 10 year bond closed the year at 2.406%. 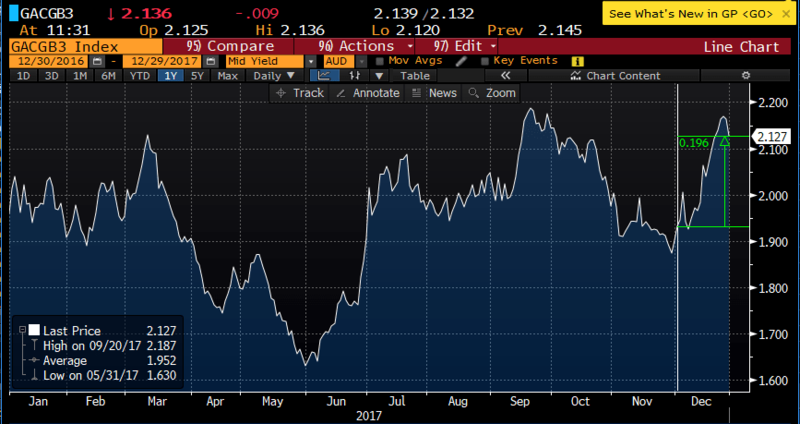 Many analysts are looking for the US 10 year bond yield to accelerate to higher levels if it can have several sessions above 2.40%. 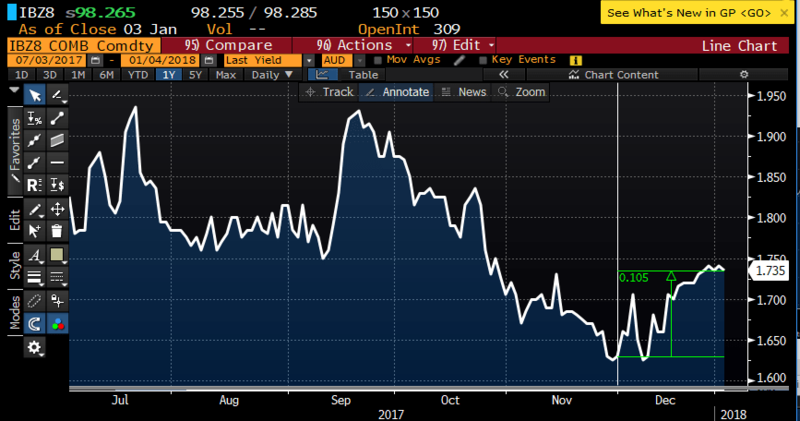 Australian bonds sold off (higher yields, lower prices). 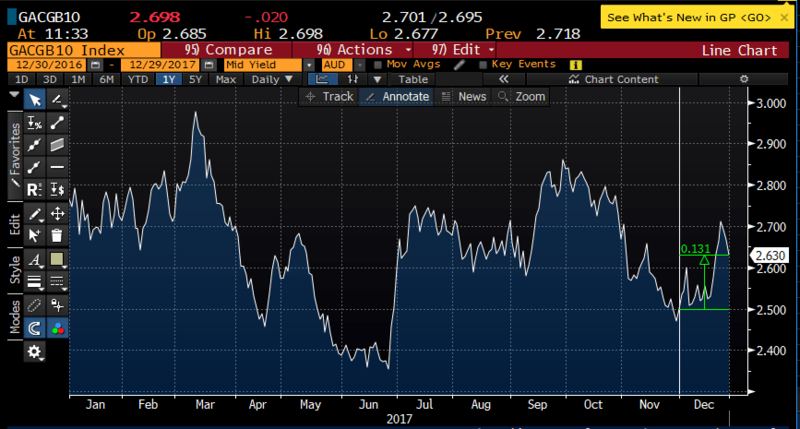 The market moved back to pricing a rate hike by December 2018. The RBA cash rate in December 2018 moved from 1.63% to 1.73%. The yield of the 3 year government bond rose by 0.23% to 2.13% creating a price fall. The 10 year government bond’s yield had a smaller rise of 0.13% to 2.63%. Expect to see further analysis by commentators on this relationship as the yield curve flattened. The Bloomberg AusBond Composite Index for all maturities (the common benchmark) produced a negative return of -0.52% for the month. The Treasury Index for all maturities, which is the single largest contributor to the composite index, produced a negative -0.73% return. The Credit Index produced a negative return of -0.21%. 0 – 3 year corporate bonds produced a small positive. All other sectors were negative due to higher yields. It is worth looking into sectors of the markets to see where the best returns were to be had. 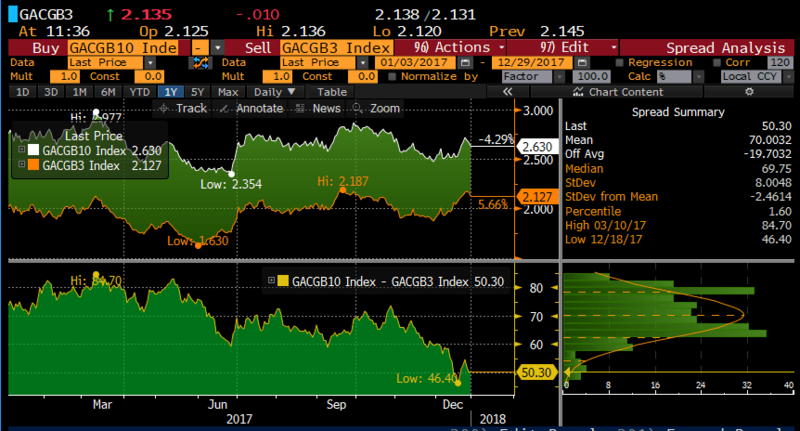 With the YTM of the 3 year government bond returning back to levels seen at the end of September, duration had a dominate influence on negative returns. This resulted in longer dated bonds performing worse than their shorter dated equivalents. In all maturity buckets investors were rewarded for holding Credit (corporate bonds) instead of government bond equivalents.